Jay was the best...in every possible way. He was well prepared , was on time and really clicked with the audience. He took the celebration to another level! Always above and beyond. Thanks. Jay! I don't think I can express in words how great Jay Edwards actually is! He was one of the most important parts of our wedding! He was very friendly and offered to help as soon as he walked in the door! He made our wedding run smoothly and I couldn't imagine our wedding without him! We got married a month ago and we are still hearing how great our Dj was. He was very professional and very flexible if he doesn't have a song we wanted he would download it immediately! He got my husband and I drinks and food and made sure we had everything we needed so we could have a perfect day! I will always remember him and I hope in the future Ill need a DJ for something else so I can hire him again! 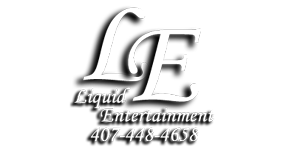 I HIGHLY RECOMMEND Liquid Entertainment! You will not be disappointed :-) Thanks again Jay, you are the best and a true blessing!! BEST DJ IN THE WORLD! Oh boy...wedding DJ. This is one vendor I was really nervous about choosing. They will make or break your wedding!! My wedding coordinator knew I was nervous about this category, so she set me up with two DJs to meet with. My first meeting was with Jay Edwards, and I knew he was the DJ for me as soon as I met him. Initially I was so impressed with his website...he totally put all my worries at ease with the website alone. Meeting him in person was even better. I had my wedding coordinator cancel the meeting with the second DJ and I signed the contract with Jay on the spot. He is just someone you WANT around you on your wedding day. Jay is professional, reliable, and he truly enjoys what he does. He did everything he could to make my wedding perfect. He even checked on me to see if my groom or I needed a drink during the reception! Probably my favorite part was him coming down onto the dance floor to teach me and my guests how to wobble. I had mentioned to him prior to the wedding that I didn't know how....but I do now! I am so glad I hired Jay and would recommend him to any bride in search of a fantastic DJ. Jay was GREAT !!! Seriously, I felt as though he was an invited guest at my wedding, he was so warm, funny, kind and a true professional in every sense. Jay was very easy to work with and responsive to all my questions. He directed the flow during the ceremony and reception and made me feel at ease. The wedding day is stressful for any bride but Jay checked in with us a few times during the reception to let us know that we were on top of the schedule. Everything went very smoothly and the guests had a great time. Liquid Entertainment went above and beyond our expectations! One of the best compliments we received about our wedding was how much fun everyone had and how great the music selection was that was played. Liquid Entertainment maintained the dance floor packed all night long. Liquid Entertainment was even able to provide the Cuban bride's side of the family dancing to all the popular latin hits. We feel very lucky and blessed to have found Liquid Entertainment! Jay Edwards with Liquid Entertainment is the best DJ ever! We were recommended to him by some recently married friends and I'm so glad we were! His prices are very reasonable and he is such a nice guy! We had a meeting before the wedding so we knew exactly how the timeline was for the reception and he made sure there were no surprises. On the wedding day, he was there to explain to all of the bridal party exactly how to walk in so that everything was perfect. The mix of music he played was fantastic - we got so many comments from wedding guests that they'd never seen so many people dancing at a wedding. In addition to being an awesome DJ, he really cared that everything was perfect for us. He kept our drinks full and was right there to help me and the photographer fix my dress after someone stepped on it and ripped the bustle out. We were so impressed by his awesome personality, professionalism, and quality! I would recommend him for any event! Jay with Liquid Entertainment was amazing to work with, so much so, that I referred him to two other friends who had him at their weddings as well! He is very professional, and works to give you exactly what you want for your wedding according to what your vision is. We felt completely trustworthy after meeting with him once that I had nothing to worry about on my day, and I was right. He was amazing and everyone that attended my wedding agreed! Jay from Liquid Entertainment, provided the DJ service for our wedding on 9/7/12. I couldn't have asked for a more helpful, attentive DJ. He helped out with the entire flow of our wedding. He worked with the caterer to coordinate cake cutting and toasts and everything. He played all the music that we asked for and kept our wedding rocking the whole night. He was so friendly. He also provided lighting for our wedding. The lighting really helped bring all the decorations together. I am so thankful that we had Jay at our wedding. He really made our night PERFECT!!!! Jay was great! He was great at helping guide me through the planning process of what music to play and when to play it. He kept the energy up all night and the party going! The dance floor was always packed! He was a great MC and DJ. He kept us informed throughout the entire reception and was getting me a new beer each time I turned around! And don't forget about the lighting! He also set up amazing purple up-lighting in our reception that really set the mood we wanted! Thanks again Jay! So the dj was one of the most important parts of my wedding. Jay did not disappoint. Amazing! He is great to work with..he played every song I wanted to hear. He's classy, and kept my dance floor crowded for the entire reception. My guests said it was the best party they had ever been to! Thank you soooo much Jay!!! Jay was recommended to us from our wedding planner. Once she told me about him, I looked up his reviews on wedding wire. Needless to say, we were impressed by the reviews and our initial consultation and booked him. On our wedding day, all the reviews that I had read were completely validated. Jay kept on checking up on my husband and I for drinks, food, really anything we might of needed. He also acted as a bouncer for part of the night when some unruly groomsmen were asked to leave the reception. He stayed within our music choices no matter how many people requested the cha cha, and he kept the dance floor moving all night long. Everyone had an amazing time! Jay was just as active outside of the DJ booth as he was inside it... he went above and beyond any normal DJ job requirement. And not because of cost or ego, but honestly because he has a big heart. He was fantastic and more than we could of asked for. We would highly recommend him to anyone! Jay Edwards is AMAZING! He went above and beyond our expectations... our wedding was an awesome party, just like we had hoped! Jay offered us drinks, lighted our decorations per our day-of coordinator's last-minute request, set up the microphone, helped place our chairs (in the rain! ), kept everything on time, and did an amazing job playing the songs we wanted (including some country music) and the songs to which the audience could relate. And of course, Jay did not play any of the songs we "X"ed off our list. Oh, and my husband and his buddies especially appreciated Jay downloading and playing "Turbulence" for one last man dance (I have no idea why they like the song, but it seems to be on a playlist early in the morning after game days as a "pleasant" way to rally the real players.) Haha! We are so grateful to Jay for everything! He is a true professional, and we really appreciated all that he did to ensure we had the best wedding we could imagine! We had an awesome time having Jay at our wedding. He paid so much attention to detail to make sure everything goes according to what we hoped for. He even helped in the decorations, most especially with the aisle runner placement. He really goes above and beyond his duties in a very professional manner. He was very attentive to our needs thereby keeping us relaxed and confident that nothing will go wrong. He will work with you from start to finish. We definitely recommend him to anyone! Thank you very much Jay! Jay Edwards is an awesome DJ! The music was such a hit at my wedding. Everyone is still raving about how great the flow of music was during the reception. It was a great party! He did not make himself the star of the show and he didn't play anything cheesy! I LOVED having Jay as our DJ, he is AWESOME! Visit Jay's website for a sample of his 'voice'! Silly as it sounds, that's one of the big reasons I hired Jay; along with his personality and reasonable pricing. I'm not a fan of cheesy DJ's and weird games so, I knew Jay was a perfect choice. He provides a tastefully classic performance with a great selection of music and crowd interaction. We are 110% impressed with his performance and services! Jay Edwards is hands down THE best DJ in Florida. My feet were KILLING me the next day from all the dancing. LOL! He completely blew my husband and I away with how he customized our playlist. We are music heads and were pretty specific and picky about what we wanted. Jay NAILED it. He was so on the money it was incredible! Throughout the night we received compliments on the music. His personality was fantastic and throughout he made sure we were doing okay. He even brought us drinks at one point! What DJ does that?! hahaha. He's amazing. I can't recommend him enough. Jay was awesome to work with and he was a great DJ. He made sure everyone was having a good time and played everything we wanted. Finding the right Dj can be hard. There really are alot of them out there. I wanted a professional Dj with no gimmicks that knew his music and weddings. That would be Jay Edwards. When you hire Liquid Entertainment you get Jay, not a name pulled from a hat. His experience in radio lends him the skills to be a great dj; not to mention it is pretty cool to listen to 105.1 and say "Hey, thats my DJ!" From the meetings to the wedding, Jay was professional and friendly, we left every meeting laughing and feeling good about our decision. We had a lot of special requests for our reception and he handled them all with ease. At the wedding he made sure we were taken care of and even discreetly made sure I was ok with a request for Polka music. If you want a random dj that pulls giant hands out of a gimmicks box and talks like he is announcing lets get ready to rumble, you might want to look elsewhere, but if you want good service, good music, and a heard working dj who loves what he is doing, definitely go with Jay Edwards at Liquid Entertainment! Jay was fabulous!He really makes you feel special on your wedding day with all of the extra help he is! His voice is MADE for announcing and his music playing and timing was perfect! He is TOTALLY worth the extra money! Awesome! Jay provided DJ services for my wedding on 5/21/11 in Alamonte Springs, Florida. He did a wonderful job and we could not have been happier. Everyone was giving us compliments all night on the entertainment. We highly recommend him for any function that you have. Jay kept our party so classy and had everyone out on the dance floor:) He really listens to what the B&G want played and will not play songs from your do not play list no matter how hard a guest is begging! Jay is such a professional and if he is free on your day...BOOK HIM. He really is the best DJ in Orlando! Jay Edwards made our wedding so much fun! He got all of our guests really involved and dancing all night. He was amazing and really attentive. We couldn't have asked for a better DJ! The 2 most important wedding vendors you will choose are your DJ and your photographer. And Jay is, quite literally, the best. Jay did my son's wedding on April 2nd. He keeps the party flowing, he knows instinctively when to flow from one musical feel to the next, and he has a knowledge of music that is amazing. Bottom line, your guests will have a WONDERFUL time and that will be because of Jay. He was very responsive throughout the process (and I had a LOT of questions! :) ) and gave us some great advice. On the day of the wedding, he did both the outdoor ceremony and the reception, and everything came off perfectly. He was also able to provide the uplighting, getting just the right color I wanted. He has a great voice, a professional appearance and demeanor, and when the evening was supposed to end, everyone was still out on the dance floor having a blast so we had to extend it a half-hour. You don't see it very often in a wedding where almost EVERYONE is out there dancing and no one wants the night to end. My son received calls and texts for a week afterwards from his friends that it was the best wedding they'd ever been to. That is what it's all about - the guests enjoying themselves and sharing your special night. As a mother, I'll never forget the last dance to "What a Wonderful World" when Jay had everyone form a circle around my son and his new wife ... I looked at how happy they were and what a wonderful night they had and realized that Jay had so much to do with making that night so special for everyone. Thank you, Jay! Brides, book him early! It will MAKE your wedding!! Jay Edwards is the perfect DJ. He did an amazing job!!! I would recommend him to every bride!!! Jay was awesome to work with all the way through the planning process. I changed my mind a lot and he was completely fine with it. On the day of he really let me decide if I wanted to make any calls on odd requests. Also, he got Kory and I a drink right after the toasts when we were served our food and that was something that actually made a huge difference. If I had gotten up and walked all the way through our guests, my food would have been completely cold by the time I got back. It was good to have that few minutes with just him and I and Jay did that all on his own. Thank you so much Jay! When I first got on the Knot, Jay was one of the first vendors I heard about. As soon as I found out that he was the back up announcer for the Orlando Magic, I KNEW I had to have him. At this time, our wedding did not even have the Orlando Magic theme. I was just in love with the fact that he was the back up announcer. He made our day amazing. I know not one thing about music. I listen primarily to metal and a lot of underground-ish stuff, so I'm clueless when it comes to dance music. I let Jay have complete control, and he kept everyone moving and the party going all night. And, he went above and beyond for me. As you'll end up reading a couple of times, our original venue caught fire, and I was left finding a new place for the wedding (about 5 months before the big day). When I contacted all of my vendors to tell them what was going on, Jay was the first to get back to me. I LITERALLY had sent an email to all of them at 8:00 on a Sunday night, and by 8:15, I was on the phone with Jay, and we were talking about a new venue. It was amazing. But that's not all. As I'm sure you guys all know, our wedding ended up being a HUGE Orlando Magic themed wedding. Well, Jay arranged for a former Orlando Magic player to "stop by" the wedding. It was a huge surprise, and it was totally awesome. Jay also did the uplighting at our venue. HOLY MOLY did it make the place look amazing! The whole wedding was a blast. The music was great, and the llights made the room look amazing. My mother listens to Jay every morning on her drive to work. After hearing him talk about a wedding he had done over the weekend she immediately called in to talk to him. She hired him that day for my wedding. He immeditately mailed us a packet to fill out. After reviewing his list of songs my husband and I decided we wanted to customize our play list, which Jay was very open to. The day of he played all of our songs and mixed in some great dance hits. All of my guests thoroughly enjoyed themselves. As for my husband and I we could not have asked for anything more! Prior to entering the reception my bridal party was lined up outside the ballroom. My wedding planner and Jay came out to let us know how things would go. Jay said he would take care of anything, he meant anything we would need all night. My wedding planner said he shouldn't make such big promises, but let me tell you he lived up to every word. He cleared my husband and I's plates, alerted us first before transitions and was constantly checking on us to make sure we had everything we needed. He prepared the music for our ceremony as well which was wonderful! I can't thank him enough, and I highly recommend him!!!! Awesome DJ!! He is friendly, has a great personality and is organized and well prepared! He personalized our wedding and reception. Our reception was the greatest night ever because of the DJ. He minimized the lengths of several songs, for example, Mother/son dance, etc., which is great and makes things run smoother. The music was awesome and he had everyone dancing and enjoying the night. He is a DJ and a wedding planner/coordinator all in one! Right before I was suppose to walk out he noticed my runner was not rolled out so he rolled it out. During the ceremony, he came to my rescue and fixed the back of my dress for me. He brought me a drink while I was taking pictures. These are just a few of the many things he did that night for me, he worked his tail off! I highly reccommend him! Jay Edwards was the perfect DJ -he was professional, courteous, and FUN! All of our guests complimented us (and still do) on what a fun reception we had. We met with Jay twice before the wedding to go over the details of what we wanted to play, didn't want to play, a few special moments we wanted, etc. and Jay delivered. Our wedding reception was perfect and that is thanks largely in part to Jay. Amazing, amazing, amazing. Jay was so easy to work with. He made sure we had drinks the whole night and the song choice was great. We put off making an list of what to play till the last minute so it never really got done. Jay gave us a list and we crossed off no, circled yes's and the rest were fine with us. He did a great job knowing our style but that list and everyone kept telling me what a great play list we made. I told them it was all Jay! Hiring Jay as your DJ is one of the best choices that you can make - and not an expensive one either! Jay is fun, professional, prepared, and constantly looking out for you and other important guests on your wedding day. This includes getting food for people, refilling drinks, making sure I had a place to sit (I have trouble standing in one place for longer than a few minutes) when I was waiting for the ceremony to start....many things set Jay apart from everyone else in the business. He doesn't really advertise because DJing weddings is a side gig for him, because he works on the Mix 105.1 morning radio show during the week. He doesn't NEED to advertise because word of mouth about Jay is fantastic on its own. He will also shorten songs if necessary (we had some father-daughter and mother-son songs picked out that seemed long, and he shortened both flawlessly). And we got a free cd of our reception songs at the end of the day! A nice touch. Book Jay for your wedding! A DJ can make or break your wedding. I have been to so many weddings and their DJ was so bad, that it made the wedding boring. Jay is an AMAZING DJ. He knows just what to play to get everyone dancing. Our dance floor was full the entire night. He played just the right musice to have my mom's 40+ friends dancing, and my friends 20+ dancing at the same time. He went above and beyond to make our wedding night fabulous. We always had a drink in our hand. He even gave my husband a beer to take with him, as we were leaving the reception. He made sure we had whatever we needed, and kept us up to date on everything that was going on throughout the night. I couldn't even say enough about how wonderful and professional he is. If you haven't booked your DJ, he is the one to book. I promise he will exceed your expectations. Amazing. That is the only word to descibe Jay Edwards! Jay is the best DJ you can get!! He took care of everything that we needed all night long! You can tell that he truly loves what he does and is very good at it! Everyone had a blast at our wedding thanks to him. He was definitely the most important vendor for our reception! Thank you!!! Jay is AMAZING!! He did everything we asked and then some! He kept the party going and the dance floor packed. not to mention, he took such good care of us and kept seeing if my husband and I needed anything (ie: drinks, etc). There was a problem at the ceremony where there weren't enough chairs (hotel's fault) and I heard that he immediately jumped in to help out. He communicated through out the entire planning process and just went above and beyond for us. If he's free on your day, book him ASAP! I'm still hearing compliments about him from our guests. He's very professional, fun, and not cheesy at all!! I can never say enough wonderful things about Jay Edwards of Liquid Entertainment, from the very first phone call to the thank you at the end of our big day, Jay was a pure joy to work with. His personalized selections of music truely defined our special day as just about us. He is there for the Bride and Groom and still entertains the guests to keep the party going. To us, there is no one more suited to be a DJ than Jay Edwards, a TRUE entertainer and gentleman. Jay did a fabulous job at my daughter's wedding on 9/5/09. His music selections appealed to the crowd and he kept the party moving. He is very professional and a pleasure to work with. I highly recommend him! AMAZING! The only word to describe Jay's services!! He was so professional, helping us with everything the day of the wedding. He was the first person to ask us if we wanted drinks or food while we took photos! I received so many compliments about our DJ the night of our wedding! I would recommend Jay to EVERYONE! He was outstanding and went above and beyond any DJ I have ever seen work do. He is THE best DJ in Central Florida! Jay was great! He made sure everyone was having a great time at our wedding. He made sure to play a good variety of all music for every age-group! He kept the groom and I dancing all night! Highly recommend Jay!!! WOW! From memorizing my wedding parties' names to making sure I was hydrated to basically being the organizer for the whole evening, Jay was WONDERFUL! He made sure he had the versions of every song that we wanted - even though he downloaded about four versions of one song just to find what we wanted! He was professional and personable and worth the price! This was the best vendor I hired! I actually didn't meet him until my wedding day but he was very helpful and nice to work with on the phone. I didn't have much of an idea about how a wedding reception should flow and he helped me to figure it out. He provided his knowledge but was very flexible and let me make my own decisions. On the day of the wedding, he was offering to get my dad and I water as we were waiting for the ceremony to begin. During the reception he was checking on my husband and me and telling us what was coming up next. He kept the night flowing very smoothly and was very responsive to our needs. He also did a great job keeping people on the dance floor. I couldn't imagine having anyone else DJ. Jay was absolutely amazing! He was always on top of everything. Jay called me a few days in advance to go over songs, and I was clueless. He provided suggestions and helped me choose songs that were right for us from walking down the aisle, to throwing the garter! He had drinks for my husband and I, as well as our parents, as soon as the ceremony was over and we started pictures. He made our plates for us when dinner was served so we had time to go table to table and socialize with our guests. He was never over the top, very professional, and made the night very enjoyable for everyone. Jay is awesome, and kept our party going. He followed all of my request and went above and beyond. He greeted us at the WPFM with drinks in hand for us! Super cool and down to earth! If hes available for your wedding datebook him! Hes totally worth the money. Your DJ makes or breaks your wedding! Best Dj I have ever heard. He actually works for a radio show, Mix 105.1 in Orlando. He really went above and beyond his duties. He was basically an event coordinator. He let us know how much longer until he was going to announce he bouquet toss, dollar dances and so on. He was even running back and forth getting drinks for the bridal party. We told him a general idea of what type of music and the music selection was wonderful. I can honestly say this is the best wedding DJ in Central Florida. Jay was also an incredible vendor. He was professional, did his job with excellency because no one wanted to stop dancing when it was time to go! He was never hokey or cheesy, but chose great music and kept the party going the whole night. Everyone still talks about how great our party was and that's due to Jay's great DJing! Jay Edwards from Liquid Entertainment was such a wonderful DJ! You couldn't get our guests off the dance floor! Everyone had an amazing time! I would definately recommend him! He had great suggestions and really listened to what I wanted! He was there early and was very professional! He made sure me and my husband were taken care of! What can I say about Jay? That he is AMAZING! He is such a fun guy and made my wedding more than what I had imagined- I dont think anyone was sitting down the entire night and that's just what I wanted. He has worked with me now on a couple of programs and I would never turn to anyone else....unless he's booked...which is often! He is so down to earth and really knows how to feel out a crowd! He rocks and I would recommend him to anyone anytime!